Due to CNN’s comprehensive coverage of Hurricane Sandy, the network will continue with storm coverage during evening programming on Tuesday, Oct. 30. 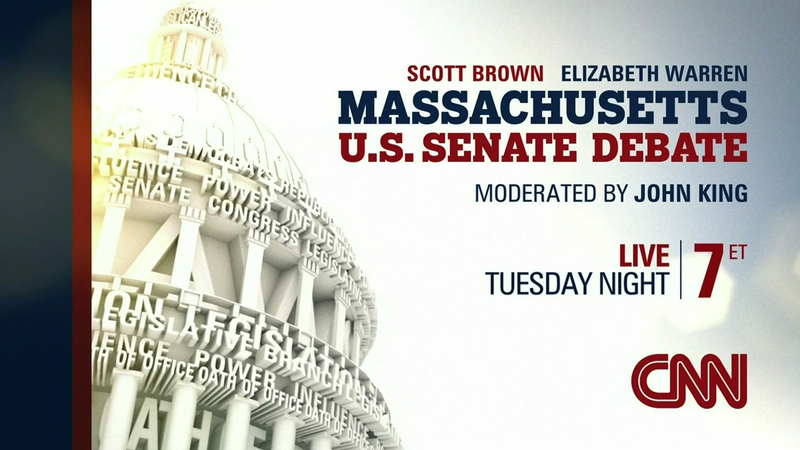 The network will not air America’s Choice 2012: Massachusetts Senate Debate, the debate between Sen. Scott Brown and Elizabeth Warren in the 7 p.m. ET hour. CNN will live stream the debate on CNN.com/Live. On Tuesday, Oct. 30 at 7 p.m. CNN will air America’s Choice 2012: Massachusetts Senate Debate, the final debate between Sen. Scott Brown and Elizabeth Warren, one of the most closely watched races in the country. CNN chief national correspondent John King will moderate the one-hour debate in front of a live audience at the WGBH studios in Brighton, Mass. CNN will live stream the network’s TV coverage on CNN.com/Live and the debate will replay at 11 p.m.